What a run here by Olly Woodburn as they gets over the gainline!. Joe Simmonds has made 10 good tackles so far this game. Manu Tuilagi has made 10 good tackles so far this game. Gareth Owen makes the break as the defence re-enacts the parting of the red sea. Valentino Mapapalangi comes on for Leicester. Michael Fitzgerald leaves the field. Fabulous play by Exeter has led to Richard Capstick being able to wriggle through a gap. Trouble here as Gareth Owen breaches the defence. Exeter decide to make a substitution, with Richard Capstick getting some game time. Exeter decide to make a substitution, with Dave Ewers being replaced. Exeter make a substitution with Ian Whitten coming on. Exeter make a substitution with Henry Slade coming off. Olly Woodburn has made 10 good tackles so far this game. Exeter sub Jack Maunder comes onto the field. Nic White departs for Exeter. Guy Thompson comes on for Leicester. Mike Williams leaves the field. 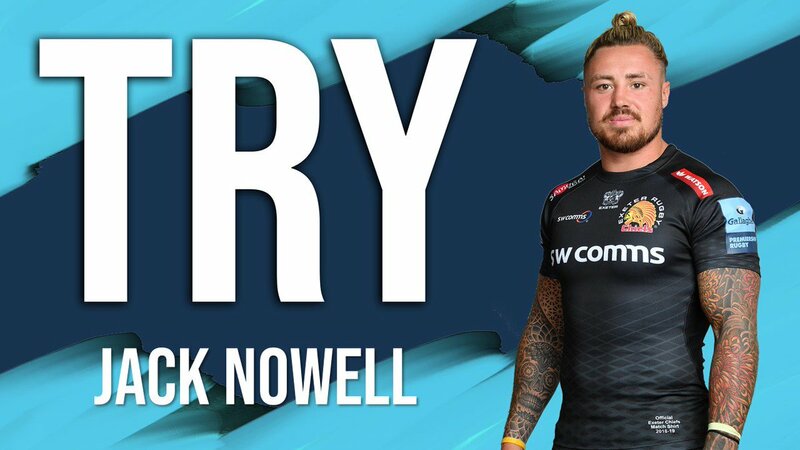 Jack Nowell intercepts the pass to race ahead and score the try for Exeter. This is dangerous for the defence as Jack Nowell bursts through to advance the Exeter attack. Tom Youngs (Leicester) is shown the red card. Henry Slade has made 10 good tackles so far this game. Joe Simmonds sets up the try. The defensive line has been broken as Santiago Cordero goes through the gap. Exeter make a substitution with Tomas Francis coming on. Exeter make a substitution with Harry Williams coming off. Exeter sub Ben Moon comes onto the field. Alec Hepburn departs for Exeter. Luke Cowan-Dickie comes on for Exeter. Jack Yeandle leaves the field. The Exeter supporters go wild as Joe Simmonds successfully kicks the conversion. Incisive passing by Exeter is finished off by Ollie Devoto, as he goes over for the try. 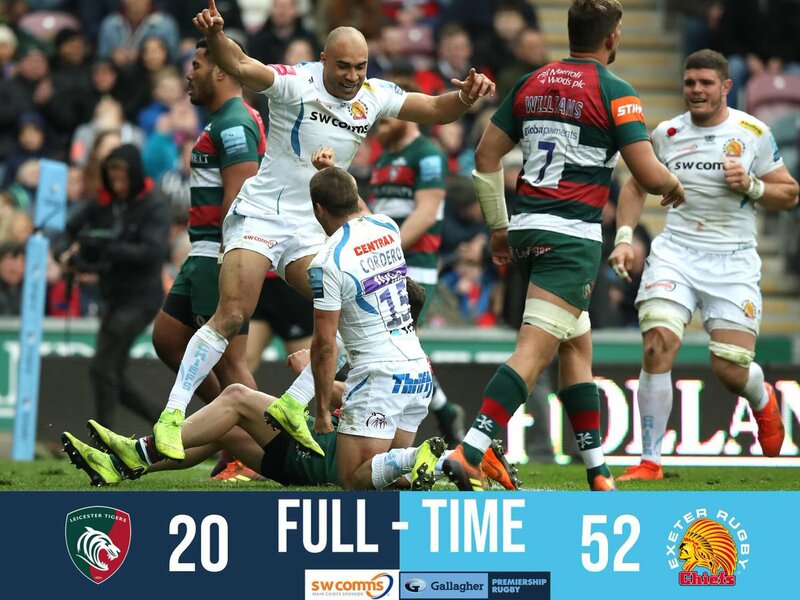 What a run here by Henry Slade as they gets over the gainline!. Joe Simmonds makes no mistake with that penalty goal attempt. Sam Harrison sets up the try. Tom Youngs scores the try from close range. Fabulous play by Leicester has led to Jordan Olowofela being able to wriggle through a gap. Trouble here as George Ford breaches the defence. Jack Nowell (Exeter) is shown a yellow card. Olly Woodburn sets up the try. Silky skills by Exeter ends with a try for Henry Slade. A gap opened in the defence and Olly Woodburn took full advantage. The defensive line has been broken as Don Armand goes through the gap. Joe Simmonds does the business as his conversion attempt goes over. Spellbinding play by Santiago Cordero is finished off with a try. A wonderful passing move by Exeter is finished off by Olly Woodburn. Matt Toomua played a key part in that try. 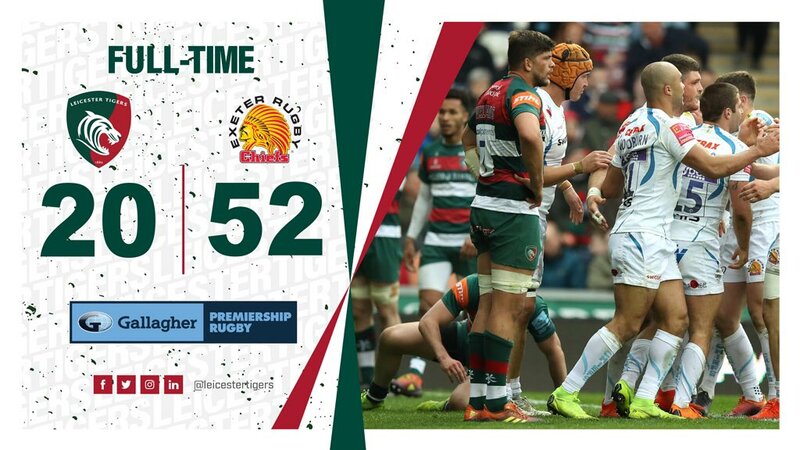 A series of passes by Leicester results in a try for Jonny May. That's a great try assist by Nic White. Exeter are only a few metres out, surely they must score! And they do with Jack Yeandle touching down. Nic White sets up the try. Great hands by Exeter leads to a try for Matt Kvesic. Trouble here as Matt Kvesic breaches the defence. This is dangerous for the defence as Henry Slade bursts through to advance the Exeter attack. A gap opened in the defence and Brendon O'Connor took full advantage. The defensive line has been broken as Olly Woodburn goes through the gap. Tough day out ... for all of us. 78 More basketball from Chiefs. Sadly you can't pass like they do. Forward. @bdidddy69 We're with them until the end. No matter what. 73 Not often I type this: Good to have a reset scrum . . . bit of sanity back to the proceedings. @JoDay18 Same for all teams. Lot of work putting those names on! 68 Woodburn touches down, but that ball was tapped to him and it went forward - by quite a long way. 67 Scrum penalty for Tigers. Their lineout about 30m out. Not straight at the lineout. 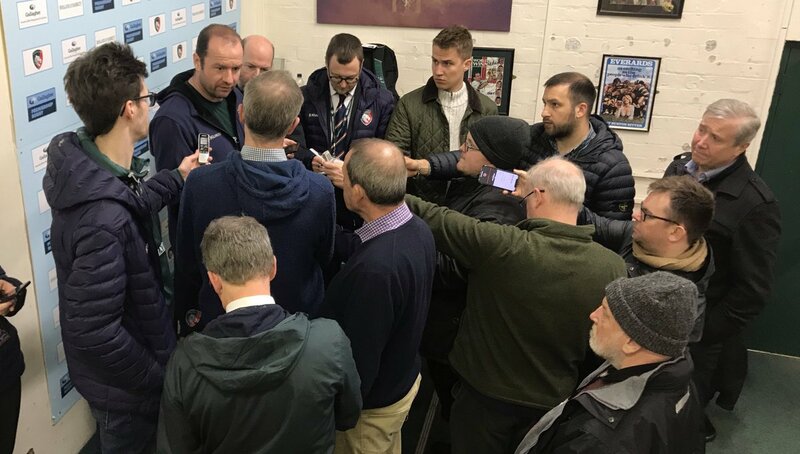 Tigers scrum. 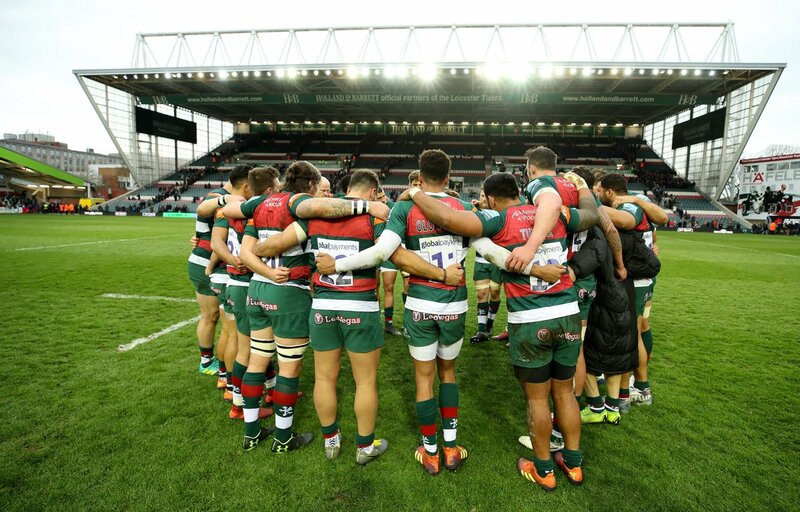 65' Fifteen minutes remaining at Welford Road as the visitors make a host of changes. 63 Tigers go quickly from a penalty. Ford jabs the ball through Slade wins the race to the line - Chiefs 22 restart. 61' Simmonds converts from almost in front and Exeter extend the lead to 32 points [20-52] at Welford Road. 57 Scrum pen for Tigers, Their lineout at their 10m line.